Just about 19 years ago, Brad and I drove to Washington, D.C. (or, more accurately, the LDS temple in Kensington, Maryland) to celebrate our marriage with our families and some close friends. We have all added a few wrinkles since that January day. We have also added a few children, a few addresses, a few jobs, a dog, hundreds of sunrises and sunsets, a little rain, and a few spectacular storms. In honor of all those years of more sunshine than storm, we decided to run away to St. Louis for the day. After all, we have lived in central Illinois for nearly four years now, and we have never explored what turns out to be a surprisingly charming city. The weather gods blessed us with a January thaw and sun. Consequently, after waving the kids off to school, we jumped in the car and headed south. Next stop: the Cathedral Basilica of Saint Louis, with 83,000 square feet of mosaic art created by twenty artists out of 41.5 million tesserae. (Yeah, I had to look that one up. 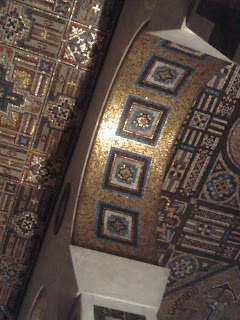 Tesserae are the little squares of stone or glass that go into a mosaic.) Mosaic covers every bit of the massive ceilings and much of the walls, depicting Biblical scenes in the rich tones of over 8000 colors. The beauty of the scene certainly inspires awe, if not worship. And awe inspires...hunger, apparently. Fortunately, the Cathedral Basilica lies in the heart of the upscale Central West End, close to the trendy restaurants and shops of Euclid Avenue. Hoping to infuse a bit of health into our day of play, we stopped in at OR Smoothie and Cafe for a lunch of organic, vegan yumminess, topped off with a couple of signature smoothies. I confess to stopping for a chocolate filled croissant when our after lunch stroll took us past the St. Louis Bread Company, but the guilt feelings faded quickly as the chocolate oozed over my fingers. Pleasantly full, we turned our attention to nearby Forest Park. As we wound our way through the park, we stopped first at the Jewel Box, a charming Art Deco floral conservancy characterized by its unique cantilevered glass walls. The greenhouse is a popular wedding spot, and even without the colorful gardens that surround the building in warmer seasons, it offers a lovely retreat from city life. We had the flowers to ourselves for a few minutes, and we drank in the rich air of the lush indoor garden. After a few turns of the park road, we passed by the St. Louis Zoo (packed with families enjoying a rare warm day in January) and drove up to the Art Museum. Through the feature exhibit, we watched the evolution of the masterpieces of Federico Barocci, then wandered through galleries of Impressionist, Realist, Asian and African art. 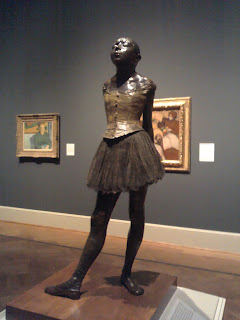 I finally learned why in the world so many talented artists waste their time painting fruit, and I stood nose to nose with one of Degas' dancers. (The girl had an attitude! My kind of girl...) I even discovered a new addition to my list of favorite paintings: John Martin's "Sadak in Search of the Waters of Oblivion." Art does good things for the soul. We wound down with a little window shopping in Richmond Heights and stuffed ourselves with a late dinner at Maggianos Little Italy. Good conversation carried us home, and I crawled happily into bed just after midnight. What a glorious day!